Our Summer Day this year was for the first time held at Honiton Community College on Saturday 2nd July. Having missed last year’s day I was really looking forward to this one and was not disappointed! There was a definite buzz in the air, as people arrived and after some initial confusion with the parking arrangements the hall was prepared, leaflets distributed, teas, coffees and cake made available ( at one point I thought I might need to catch a bus to get my cup of tea!!) and the electrics and lights sorted. What a day it turned out to be! Our morning speaker was Roy Dickinson, a man obviously very much at home in a woman’s world! A highly entertaining and amusing speaker, Roy spoke of health problems, which resulted in his journey along the road to becoming a national and very individual quilter. He was initially inspired by a visit to Walford Mill in Dorset and by Mary Bird who taught City & Guilds there. 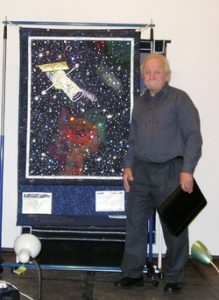 His ‘one day a week, with five days home work’ course has resulted in an astonishing variety of quilts with numerous national awards, including one Hoffman Challenge with some quote ‘very questionable fabrics!’ which resulted in a first prize, followed next year by a second prize and then a third prize in the third year!! Amazing! Roy has definitely pushed the boundaries in quilting and his engineering background has resulted in many exquisitely constructed and designed pieces. He finished the morning session with a fascinating slide show about men in the quilting world, a wonderful historical insight into some truly unique pieces. His very amusing talk kept most of us chuckling our way through the morning- a delightful and very original talk. The show and tell session allowed us to view a wide and wonderful selection of work by many of our members. I am constantly amazed by the variety of sizes, colours, techniques and designs that our members put together to create all of these wonderful pieces. Well Done to all! The weather behaved itself during the lunch break allowing many of us to eat outside. Our thanks to everyone in the kitchen who kept us supplied with refreshments and to Jean and Christine for the lovely lunch for committee members. Refreshed and replete, we returned to our seats for the afternoon session and once again were treated to an amazing talk, along yet another very personal and individual journey from Ferret and her sparky assistant/partner, Tet! 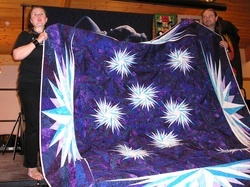 I am still intrigued by how Ferret got from astrophysicist to award winning quilter, but am very glad that she did! Once more, an amazing and stunning selection of quilts was produced to inspire and stun us. Her wonderful colour combinations and exquisite quilting, together with a wicked sense of humour and a quite colourful turn of phrase kept us entertained and laughing throughout the afternoon session. Beautiful wholecloth quilts, stunning threads, and very individual fabric choices has resulted in again an amazing variety of quilts. WOW!! This was one of the very best SWQ Days I have ever attended and I am sure this view was shared by everyone on the day. There was much ‘oohing’ and ‘aahing’ after each talk and both speakers were very generous in sharing their techniques and ideas with us all. We are so lucky to be able to invite speakers of such high quality and originality to our Quilters Days. Long may this continue! !